With my pension analysis complete and the transfer to a Rollover IRA now complete, I have added a few positions to the portfolio over the last few days. The Rollover IRA will be predominantly focused on REITs and BDCs–which stands for Business Development Company–as it is more advantageous to hold these in a tax-advantaged account due to the way dividends are treated from a tax perspective. In addition, as I cannot currently add new funds to the IRA, I will be investing the entire amount across a handful of REITs and/or BDCs. Alright, let’s jump into the details. 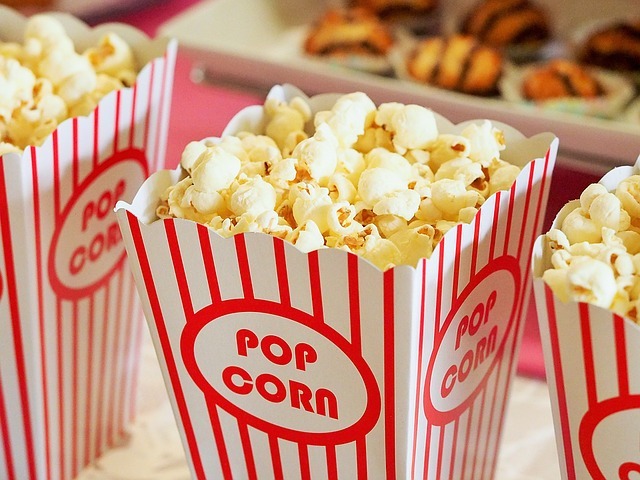 When EPR was founded in 1997, they started with a focus only on movie theaters and actually a single operator of movie theaters, AMC Entertainment Holdings. Since that time, they have diversified into additional entertainment properties as well as the addition of properties in the recreation and education segments. While the Entertainment segment remains their largest, the tenant concentration above demonstrates their commitment to diversifying and reducing their exposure with a single tenant. As of their last quarterly report, they have 396 locations and over 250 tenants with $6.7B+ in total investments. In reviewing their current investments, you will learn that EPR Properties is making substantial investments in properties that provide the consumer an experience. While movie theaters remain their largest percentage, you will also find investments in zoos, stadiums, concert venues, race tracks, golf complexes, ski resorts, public charter schools, and more. Their focus on diversification across segments and geographical locations is improving their consistency with earnings across the various lines of business. 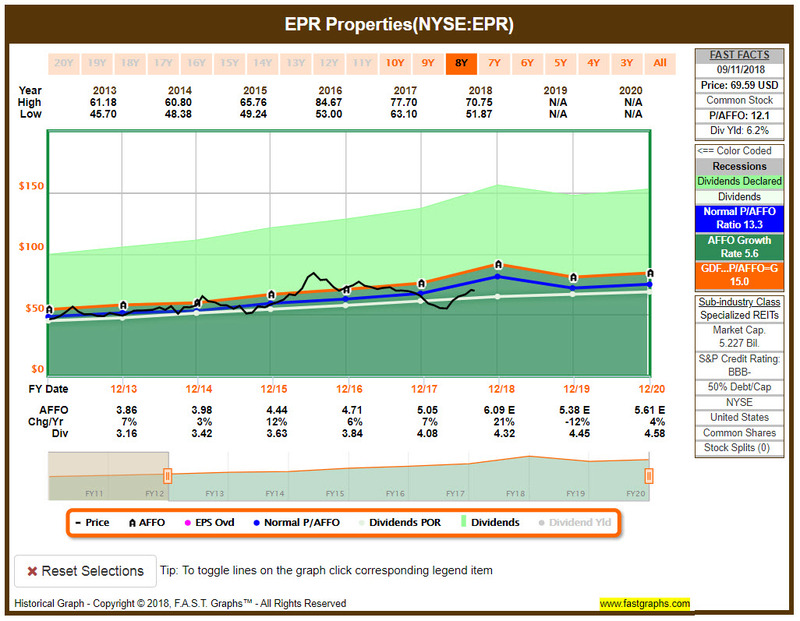 Much like my purchase of Realty Income Corporation, EPR Properties pays a monthly dividend and has built a solid track record of maintaining both a healthy dividend yield and dividend growth. At the time of purchase, EPR was paying a dividend yield of 6.2% and has an 8-year history of increasing dividends (they had an 11-year history before a drop during the bear market in 2008-2009). Their most recent quarterly earnings, which were announced at the end of July, reported FFO (funds from operations) of $1.87 which beat estimates by $0.06. Their reported revenue of $202.87M represented a 37% YoY increase and bested estimates by over $67M. As mentioned earlier, EPR did not fare very well in the last bear market but did quickly recover and restarted a respectable run of dividend increases. This is important to remember as we look to the future and the next bear market; however, EPR has been working diligently since that time to diversify their investments and that might allow them to weather a downturn better than they did 10 years ago. When I received the notification that my rollover had been processed and the funds were available for investment, I was thrilled because it finally meant that I could begin executing my plan to open positions in the handful of companies that I had selected. While I always want to make purchases at the best value possible, right now I am placing a bit more emphasis on time in the market with these holdings due to the fact that I will be unable to add capital in my IRA. With that said, I won’t chase the price and the first two days with funds available resulted in no purchases being made. One thing I have noticed with REITs is that they tend to be extremely active during the 10-15 minutes after the market opens and the last 2-3 minutes before the market closes. The 45 shares in EPR Properties will add $194.40 in forward dividend income to my portfolio. As EPR pays a monthly dividend of $0.36/share, the purchase will add $16.20 in income to every month. While ultimately it makes little difference if a company pays a monthly or quarterly dividend, this monthly payment will help add a little boost to some of the slower months. Taking a look at F.A.S.T Graphs and examining EPR Properties over an 8-year period, they are currently trading below their normal P/AFFO ratio of 13.3 by approximately 9%. The REIT sector as a whole was hit pretty hard in early 2018 and has been making a steady climb since approximately April and May. 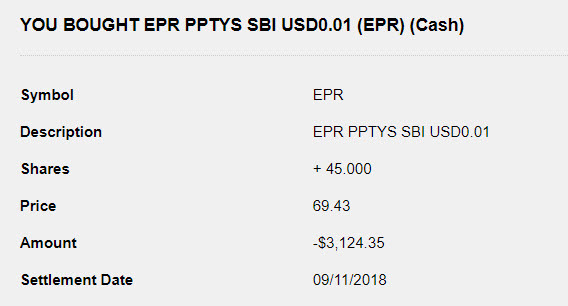 While I would have loved to been a buyer back then, I do believe that EPR still represents a decent value at this level. Looking at the performance of EPR in comparison to the overall S&P 500 over the last 8 years, you will see that they have gone toe-to-toe quite well with a total annualized rate of return of 12.2% compared to 14.7% from the S&P 500. From a dividend perspective, EPR has far surpassed the meager dividends from the S&P. As someone that enjoys experience-based outings such as heading to TopGolf with the family or going bowling with some friends, I appreciate the focus that EPR Properties has in this space–and I have been a customer at a number of their properties. With the steady monthly dividends, I am looking forward to this one continuing to DRIP and add more fuel to the FIRE. Based on the current price and dividend payment, I should be adding approximately 0.25 shares per month and that will continue to grow as the dividends are reinvested on a monthly basis. Overall, I am pleased with my entry in EPR Properties and thrilled with close to $200 in additional forward dividend income. Do you hold any REITs in your portfolio? $194 in added annual dividend income off one purchase! That’s amazing, DivvyDad. I’ve actually looked at EPR recently. I don’t know when I’ll add it to the portfolio, but I think it’s worthy of consideration. Yeah, I was happy to see that rather nice boost to the forward income from this one purchase! I’ve had EPR on my radar since I started DGI back in May and have just been waiting for this rollover to process. Look forward to possibly welcoming you as a fellow shareholder! Thanks Bert, it is hard not to like that extra income! Appreciate the feedback as well! Thanks Tom, I do love your deep dives so that is much appreciated. I want to start doing more of that type of analysis for posts independent of when I actually make a purchase. I’ll have to to take a look to see which REITs you own–I recall O is one, which I really like as well. In your research, what created the big dip from Jan 2018 till about late April when it climbed back to current levels? Based on my research, the overall REIT sector took a hard hit during the first couple of months in 2018. The cause, in my opinion, was largely a result of panicked investors reacting to rising interest rates. If you look across the entire REIT sector, you will see large declines in the early part of the year and it wasn’t attributable to any fundamental changes with the individual companies (in most cases). I really wish that I had the funds available at that time as there were some great buying opportunities, but unfortunately that wasn’t in the cards for me. A more riskier investment then usual based on your analysis. I like the diversification into the entertainment industry. I’m interested to see how this works out for you. Congrats on the massive forward income increase! Agreed, and with this pension rollover all going towards REITs / BDCs there will be a higher level of risk than I take with the core of the portfolio. Part of that is because I had never planned on this money as part of my journey towards FIRE, therefore I am comfortable taking a bit more risk. The other part is that both REITs and BDCs generally offer higher yields than your typical blue chip dividend companies, but also come with a greater level of risk. Thanks IWD, happy to be a fellow shareholder with you and beginning to enjoy those monthly payments!